I did it. I successfully played a solo in a recital and didn’t immediately want to immolate myself. The recital was put on by the Richmond Music Study Club. I’m not sure what they do, but the group sure puts on a nice show. 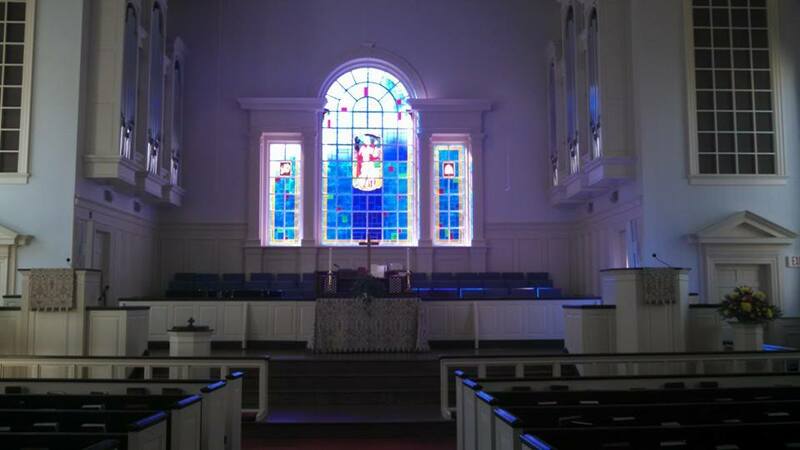 The performance was held in the beautiful Bon Air United Methodist Church. There were three violinists, including myself. Fortunately, I got to play first. Even then, my hands got a little sweaty, and I felt some stage fright. I loved being first on the docket because it gave me the chance to relax and enjoy all the other performances, which were wonderful. The three of us warmed up in the hall and adjoining lobby. Both of the other two violinists were rather young and played Suzuki Book 6 material. I got a bit psyched out by the youngest as she plays brilliantly. It’s stupid for me to be intimidated I know, because she has been playing for at least 10 years and I’ve only been playing for two. Honestly, I was happy to be included in their company. Although I played a very simple Suzuki Book 2 piece, it was one that I know very well and had a great deal of confidence in. I did finally memorize it, which was amazing because I reached my goal of going up on stage without music to futz with. Our accompanist was fantastic. Hopefully I will have the opportunity to work with her again. Was my performance perfect? No, but I don’t think anyone’s was. I had a few intonation slips and a minor bowing blip at the key change. However, in comparison to the spring recital debacle, this was a glorious victory. I’m so pleased my teacher chose to trust me. It’s one thing to blow it in a studio recital, and another thing altogether to screw things up in a mixed recital like this one. It must be so nerve wracking to be in my teacher’s position in times like that. Do the other teachers judge you by how your students perform in public? There were seven other students performing – all pianists. They were lovely to hear. The best part of all was that I was one of the youngest people performing. The average age of the piano students must have been around 60. One of the piano teachers played two very long pieces. I enjoyed them, but I’m not sure how I feel about only one teacher performing. I would have liked to have heard all the teachers perform. Perhaps they weren’t aware that was an option. The only thing I would change would be to mix up the performances. Instead of having all the violinists in a row, it would have been kind of nice to slip one in after every couple of piano pieces. However, logistically it just works better to have our accompanist stay at the piano until it’s all over rather than march up and down the stairs each time. Overall, I give this an A-, only deducting points for my minor little blips. The venue was lovely and easy to play in. The piano was gorgeous and in tune. And the reception afterwards gave us time to congratulate the other participants and network a little. I hope I get invited back next year. Let’s hope I have both earned the privilege, and can play something a bit more interesting by then. Previous Is it Live, or is it Memorex?